Published: March 5, 2014 at 06:18 p.m. 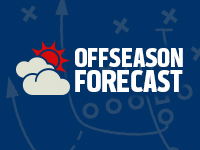 Updated: March 5, 2014 at 10:17 p.m.
With the offseason here, Around The League will examine what's next for all 32 teams. The series concludes with the New Orleans Saints. Not a ton. The offseason has played out just as we expected in New Orleans, with the team choosing to slap the non-exclusive franchise tag on tight end Jimmy Graham while parting ways with a handful of overpriced, aging veterans. Will Smith, Jabari Greer, Roman Harper and Jonathan Vilma -- longtime fixtures on defense -- have all been let go. Not unlike the Patriots up north, the Saints remain a team stamped by their coach-and-quarterback combo. As long as Sean Payton and Drew Brees are alive and kicking, any (bounty-free) offseason in New Orleans is more about patching holes and adding depth for this annual Super Bowl contender. » C Brian de la Puente: The durable center graded positively in nine of his 11 games down the stretch by Pro Football Focus. Coming off de la Puente's three solid seasons in New Orleans, ESPN.com's Mike Triplett believes there's a "good chance that they'll lose" him to another team unless the lineman agrees to an affordable deal. » LB Parys Haralson: His health is a concern after suffering a torn pectoral muscle against the Eagles in the playoffs, but Haralson is a logical pick to start across from Victor Butler in Rob Ryan's defense. Last we heard, the team was engaged in "preliminary discussions" to keep him around. Stay tuned. » S Malcolm Jenkins: Our 36th-ranked free agent, Jenkins is just 26 and certain to draw interest on the open market. We don't expect the Saints to overpay for his services, meaning Jenkins is a solid bet to land elsewhere. » OL Zach Strief: The lineman's agent has talked with the team about re-signing the eight-year veteran and said last month that "mutual interest" exists from both sides. Hugged up against the salary cap, the Saints will be challenged to keep both Strief and de la Puente. The answer depends on what happens with their own free agents. If the Saints lose de la Puente and Strief, a burning need will exist at center and right tackle. With Harper and possibly Jenkins out the door, New Orleans also could use a young safety to pair with the ascendant Kenny Vaccaro. The only other backstops on the roster -- Rafael Bush and Jordan Pugh -- boast a combined nine career starts. Lastly, Ryan's 3-4 scheme never has enough edge rushers. With Butler and Junior Galette as the only outside 'backers of note under contract, look for the Saints to draft or sign help. » RB Pierre Thomas: We'd be surprised if the Saints cut Thomas, but they're definitely talking with the runner about a pay cut. His release would shave $2.9 million off the cap with zero dead money, but losing Thomas would cost them one of the league's more dangerous pass-catchers out of the backfield. Our guess: He'll stick around at a reduced price for a team unwilling to hand the reins to Mark Ingram. » NT Brodrick Bunkley: Ripe for a tremendous salary reduction, Bunkley is set to cost $6.1 million against the cap. On the field, he generated just three quarterback hurries last season and lost snaps to John Jenkins down the stretch. The prevailing narrative in New Orleans will be the duel between Graham and the team's front office over his tag designation as a tight end. While general manager Mickey Loomis expressed optimism over negotiations, we fully expect Graham to file a grievance arguing that he's more deserving to be paid like a receiver. We don't expect him to win that fight, but we do expect Graham to ultimately become the league's highest-paid tight end. We also expect New Orleans to free up money to re-sign Strief and make a run at de la Puente. The offensive line will be addressed through the draft if they don't retain both. NFL Media's Daniel Jeremiah projects offensive tackle Morgan Moses out of Virginia going to the Big Easy with the 27th pick. Last but not least, we'd love to see the team continue to mine the draft for playmakers at the wideout position. For all the talent here, we don't see a true, elite No. 1 pass-catcher.